Apparently the answer is in the order of $3,588, based on the average U.S. annual salary ($45,230), the average number of messages in a Gmail account (5,768), and how long it apparently takes to write an email – 1 minute and 43 seconds. I’m not sure about this data. I assume that the value given for an average U.S. salary is based on some U.S. statistical data and that it is reasonable to take such a value for what is very much a finger in the air kind of exercise, even if many Gmail accounts are used by people (like students) that have low or little income or as functional accounts that aren’t really owned by anyone (such as contact points for small businesses). I have more problems with using the other data points as the basis to calculate a value for email. First, the same value is attributed to every message in the mailbox. My brief examination of my Gmail account reveals what could only be described as “a great deal of crap.” This comes about from the fact that I use Gmail as a “hold-all” kind of email account of which I give details when I register for a web site. Gmail accordingly acts as the receptacle for all the incoming marketing communications (the most polite term I can assign to these messages) and other banal information that companies feel compelled to share with me. Gmail does a fine job of marking many of these messages as spam. Others remain waiting for me to conduct a periodic review and clear out. Second, of the messages that remain, many belong to long-dead conversations that I wish I could clean up but have never because of the inability of Gmail’s user interface to accommodate power users who hold to the old habits of “read, then decide to keep/file or delete.” Even though I have turned conversation view off, I still find it tiresome to delete all the old messages in conversation threads that contain duplicated and redundant information. I did try, but gave up after a while. If Google offered a client for Gmail that had half the functionality that Outlook provides for Exchange, I think I would be much happier. And yes, I know that Outlook can connect to Gmail via IMAP, but it’s so slow… The end result is that I have a lot of what I consider to be redundant and unwanted messages cluttering up my mailbox. Third, one minute 43 seconds seems long for many of the messages that I send. I don’t think that the majority of my messages take this long to compose as I belong to the “if it can’t be said in a couple of sentences then it’s confusing” brigade (a theory that of course doesn’t apply to blogs). Most of my replies are one-liners that take ten seconds or less. Then again, I suppose that I have spent longer on other messages – but those are very much in the minority. And others might like to peruse, examine, pontificate, or otherwise dawdle over their messages. According to a white paper on the Backupify site, the 1 minute 43 second information appears to be derived from Nielsen online data, so I suppose it’s as good a guess as any, even if people like me weren’t covered by the survey. Anyway, I plugged my data into the calculator. After a short delay, the results popped out and I was told that my Gmail is worth $3,019.31. Some other analysis told me that I was “valuable” (thanks! ), “old-school” (hmmm…), an introvert (news to anyone who knoews me), and “verbose” (right on the money, but hard to figure out from Gmail perhaps?). The fine people at Backupify didn’t go through this process for love of their fellow man. 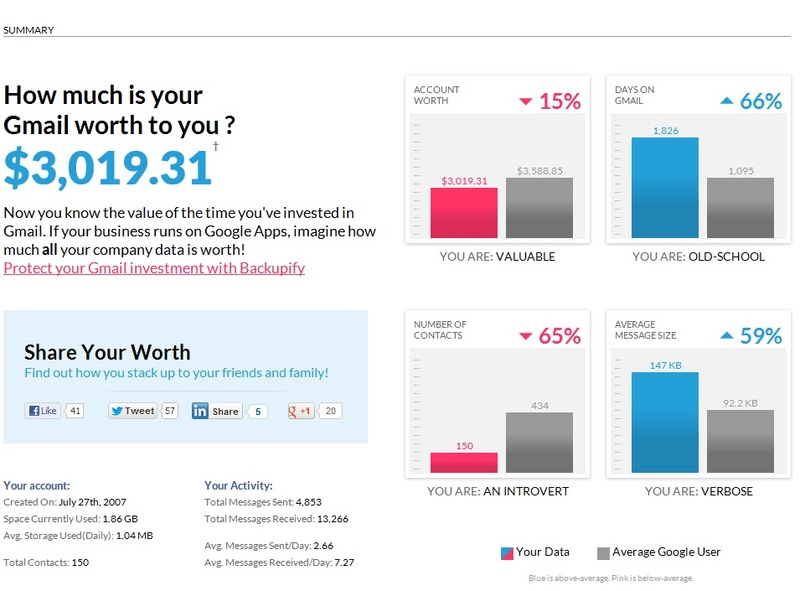 They’re doing it to convince people that their Gmail accounts are so valuable that everyone should promptly sign up for an online backup service, preferably that offered and managed by Backupify. I have one nagging doubt about the underlying value proposition. Google delivers an excellent SLA for Gmail and has done so for the last few years. They are a much bigger company than Backupify that has invested billions of dollars into many layers of redundancy (datacenter, network, servers, O/S, file system, storage, etc.). Both companies share a single obvious weakness (the Internet). With this in mind and seeing that my Gmail is only worth a relatively small amount of money that I can’t really account for, why bother with a separate backup? This entry was posted in Email and tagged Gmail, Gmail value calculator. Bookmark the permalink. 2 Responses to How much is your email worth? Yeah… which is why I used the U.S. average salary for the purpose of illustration!